It’s not easy being the Queen of Broken Hearts. Just ask Clare, who has willingly assumed the mantle while her career as a divorce coach thrives. Now she’s preparing to open a permanent home for the retreats she leads, on a slice of breathtaking property on the Alabama coast owned by her mother-in-law. Make that former mother in law, a colorful eccentric who teaches Clare much about love and sacrifice and living freely. When Clare’s marriage ends in tragedy, her work becomes the sole focus of her life. While Clare has no problems helping the hundreds of men and women who seek her advice to mend their broken hearts, healing her own is another matter entirely. Falling in love again is the last thing she wants. So when Lex- a charismatic, charming, burly sea captain- moves to town the run the marina, Claire insists they remain friends and nothing more. But even though she fights it, she begins to fall for him only to find she has a rival, his estranged wife Elinor. 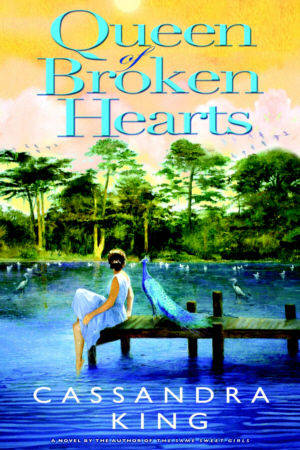 A story infused with all the flavors, textures, and intrigues of a small Southern town, with a rich resonant center, QUEEN OF BROKEN HEARTS is a bold step forward for Cassandra King. Cassandra King is the bestselling author of Making Waves, The Sunday Wife, and The Same Sweet Girls, as well as numerous short stories and articles. The Sunday Wife was a Book Sense selection and a People magazine Page Turner of the Week, and The Same Sweet Girls was a number one Book Sense selection. A native of Lower Alabama, she resides with her husband, Pat Conroy, in the Low Country of South California.